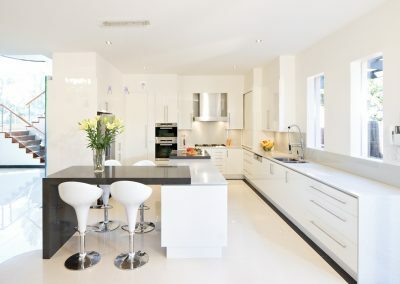 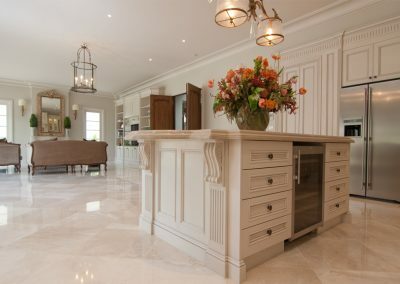 The pictured kitchen was built as part of a luxurious new home. 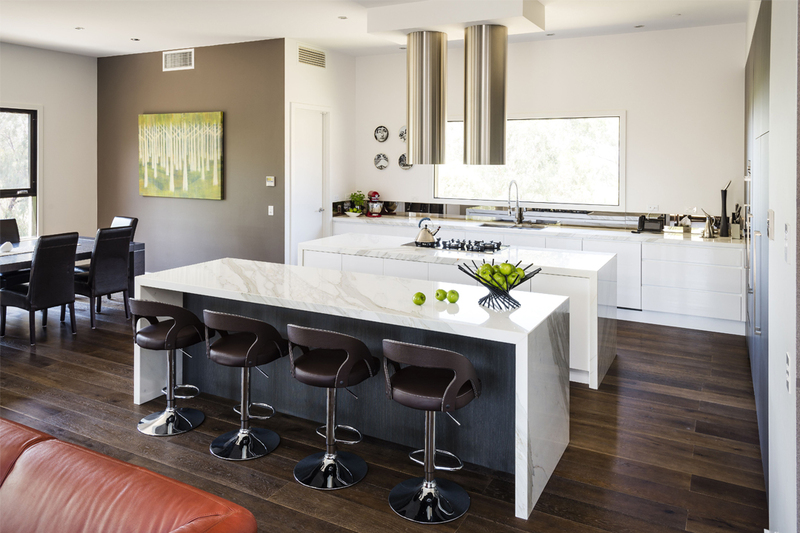 The challenge was to transform the homeowners’ ideas into a functional, contemporary, integrated space. 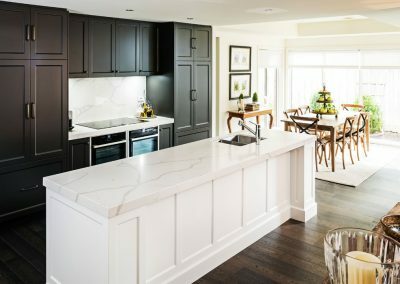 Tall, built-in cupboards along the internal wall hide the integrated fridge and freezer, while the cooktop and Qasair feature rangehood are on full display on the island bench. 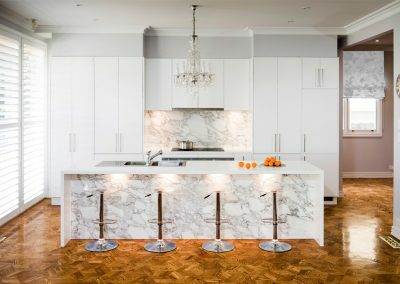 As the kitchen is part of the open-plan family living space, a visual division in the kitchen zone was created with a second island bench. 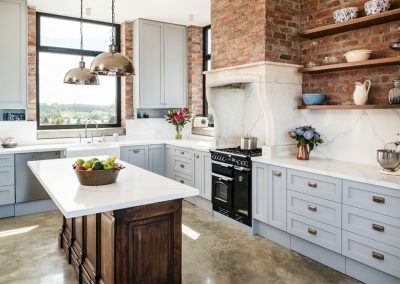 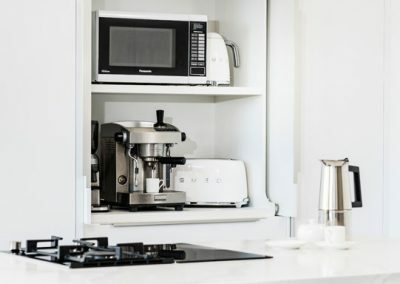 As well as the fridge and freezer, other top of the range appliances have been integrated into the joinery, including two dishwashers, a 900mm under-bench oven, and a wall oven/microwave combination. 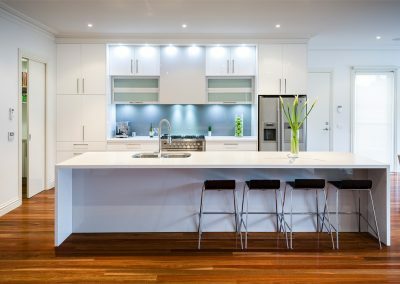 All doors are soft-close, while the drawers have a full-extension soft-close system. 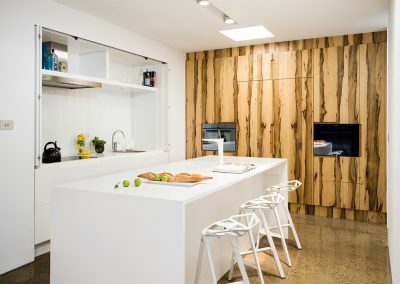 The crisp, clean lines and simple colour palette of the white, high-gloss two-pack polyurethane contrast with the textured finish of the dark timber-look laminate. 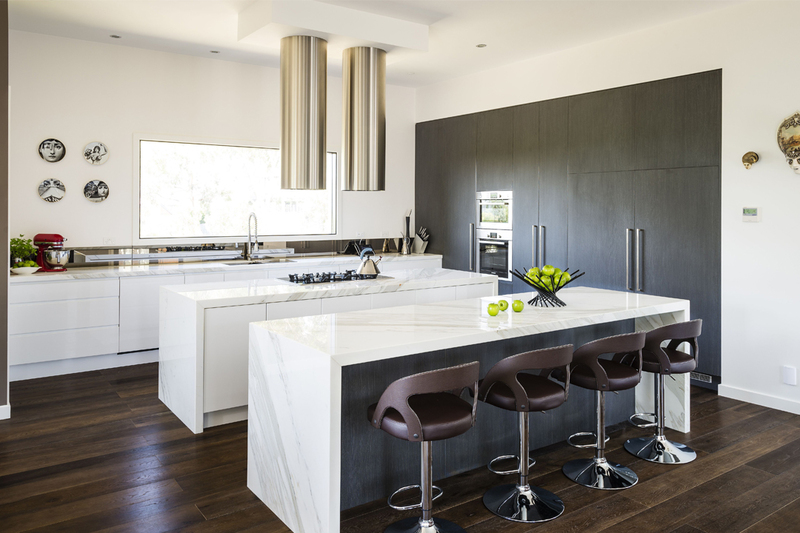 Italian Calacatta marble has been used extensively to wrap the two island benches with waterfall ends. 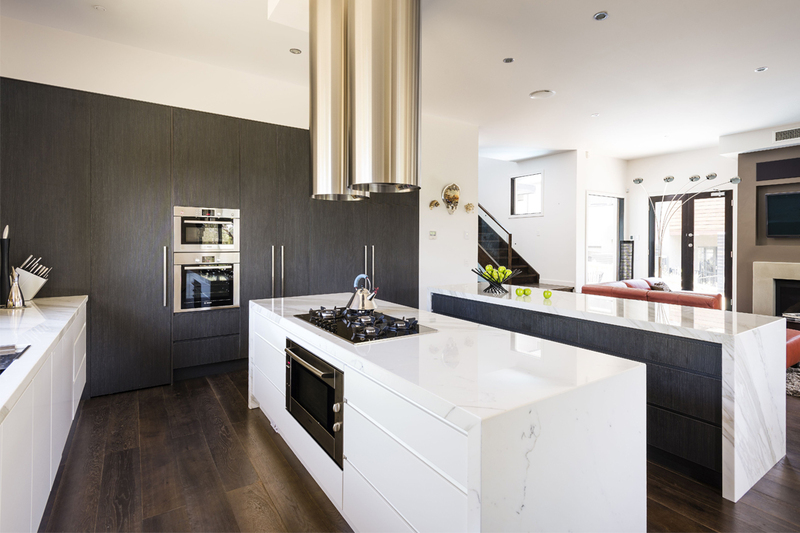 The kitchen also features a smoke mirror splashback behind the under-mount sink. 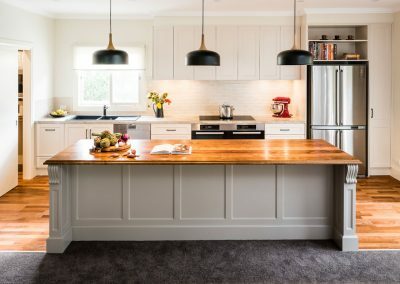 Smith & Smith Kitchens has maximised storage space by including multiple generous-sized drawers with organisational products such as cutlery and utensil inserts, a spice insert, inner pantry drawers, and a large concealed twin bin below the sink. 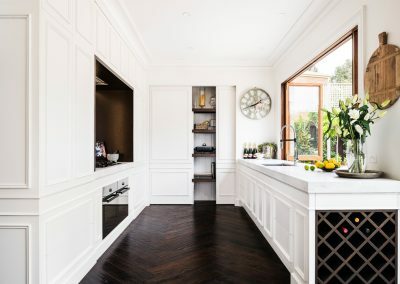 A walk-in scullery incorporates additional bench space for smaller appliances, as well as overhead open shelves, under-bench drawers, an under-bench fridge, and a separate sink fitted with a Billi instant boiled and chilled water tap system. 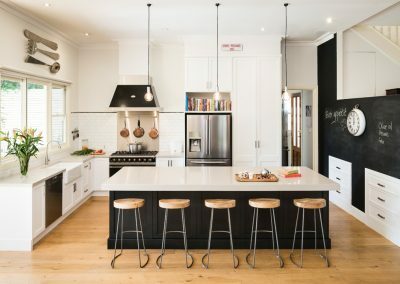 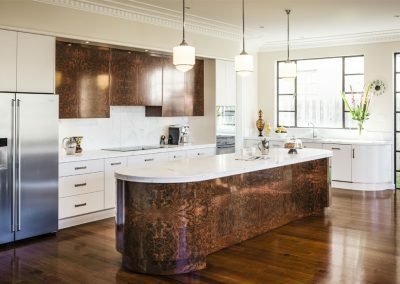 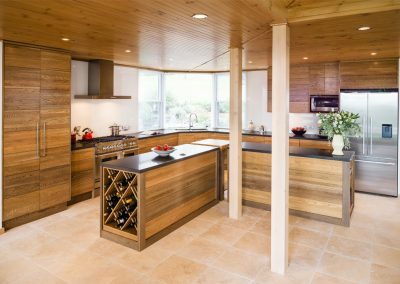 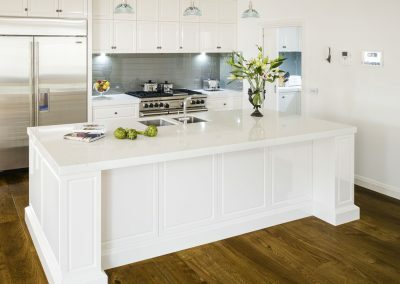 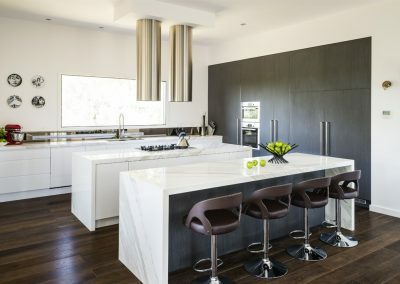 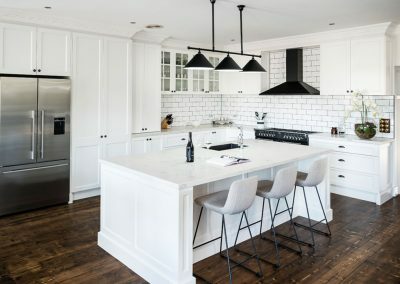 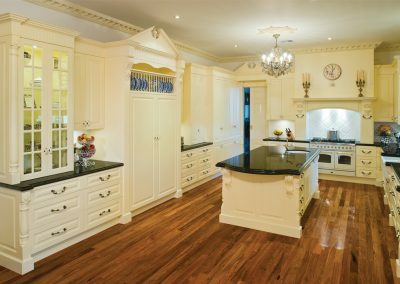 Smith & Smith Kitchens was recently recognised in the 2013–14 Australian Cabinet Makers and Designers Association (CMDA ) awards, winning Best Kitchen over $40,000 and the prestigious Presidents Award, as well as Australian Designer of the Year Award.